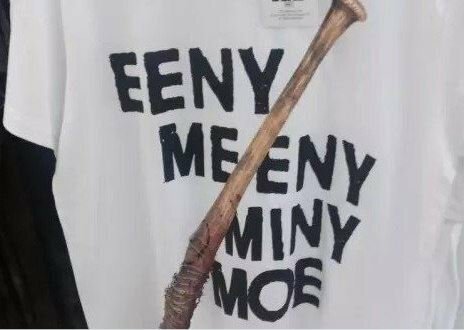 Recently Primark, a British clothing retailer, started selling a Walking Dead shirt in its stores referencing an infamous moment of Negan’s. Now they no longer sell it due to complaints. Was the controversy over the fact that the shirt references a moment of extreme violence and murder? No, that was fine. What’s actually going on is a cultural thing. Most people know the second verse of this schoolyard rhyme as “Catch a tiger by the toe.” There was, however, a racist variant used a long time ago that substituted the word “tiger” for something else. That version got around more in England than it did in the US, where The Walking Dead is produced. 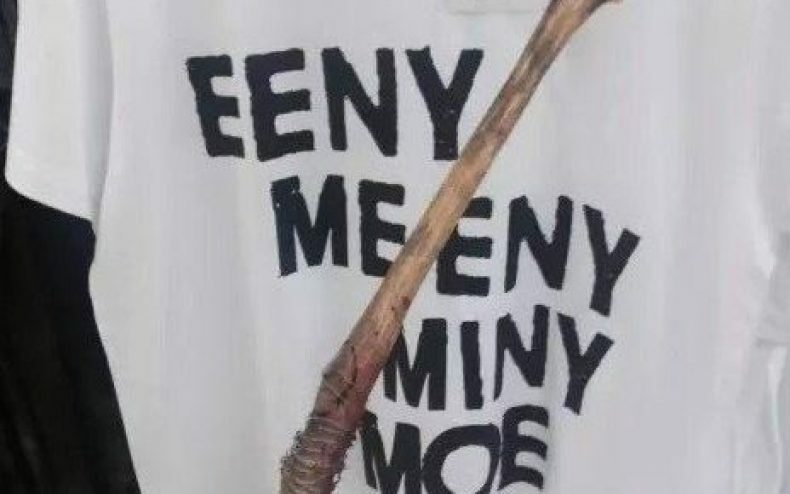 Somebody walked past the store window, had no idea what The Walking Dead was, saw the words “Eeeny Meeny Miny Moe” next to a big bat, and had a fit. That someone was customer Ian Lucraft, who raised such an immediate stink that Primark had to pull the shirt. “It is directly threatening of a racist assault, and if I were black and were faced by a wearer I would know just where I stood,” Lucraft yelled. Of course anyone who knows about The Walking Dead is aware this is just a big misunderstanding, and not an endorsement of racism (or beating people with bats) at all. The rhyme has also appeared in plenty of other media without any complaints, including the episode the shirt is referencing. Jeffrey Dean Morgan has already spoken his mind, tweeting “Holy crap people are stupid” alongside a link to a news article.